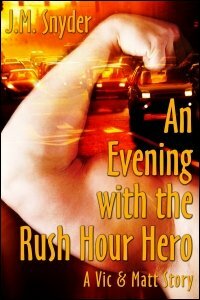 This week I’ve re-released An Evening with the Rush Hour Hero, a story originally published by Amber Quill Press. I originally wrote this story for an anthology that never transpired, and even though it can be read at almost any point in Vic and Matt’s relationship prior to the V series, it’s actually the second story I ever wrote starring these characters. Vic Braunson has little say over the superpowers he has-they come from his lover, Matt diLorenzo. In the time the men have been together, the powers have become such an integral part of Vic that he doesn’t hesitate to use them when his help is needed. One evening on his way home from work, he witnesses a traffic accident that ties up the interstate and responds without thinking.